When I first read of Shape Whiz from SimplyFun, I was pretty excited at the prospect. Playing a game while learning geometry sounded pretty fabulous. When I was chosen for the review, I couldn’t wait to get my game to try. 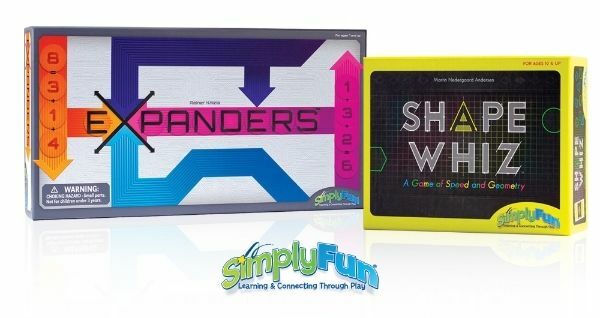 I’ve yet to meet a dull learning game – in my experience, educational game creators tend to be pretty creative in their quest for fun learning, and SimplyFun didn’t disappoint. Rules were simple, well written, and easy to understand. 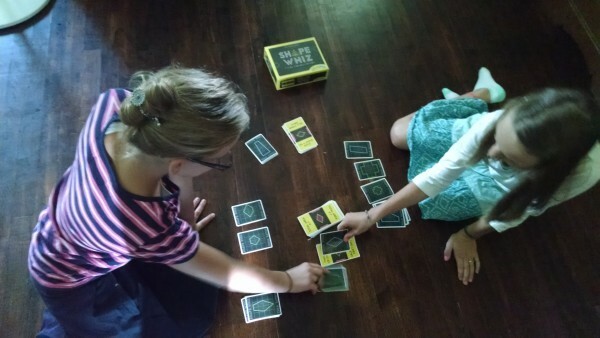 We were about ten minutes in first time set up and reading instructions before we were able to play. After struggling and making a fool of myself and my obvious lack of knowledge, I found the “Principles of Geometry” section of the directions and learned what I ought to already know. Much better! Listed for ages 10 and up, I think that’s a pretty fair assessment of appropriate ages. My ten and twelve year old girls gave me a run for my money quite well, but Sterling, 8, watched but didn’t choose to try to play. Decent reading skills are needed unless you have a game announcer – but that’s pretty doable and would ease tension if reading might be an issue. 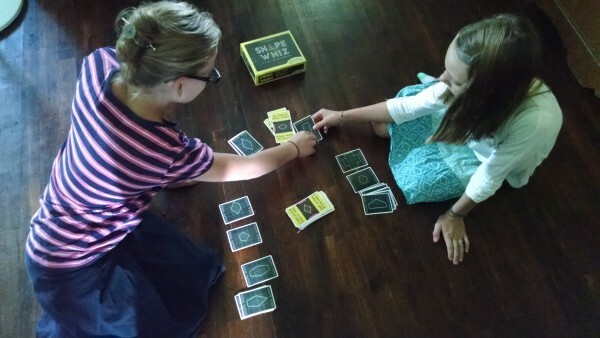 We had a great time playing and this one and while it certainly falls under the educational board game category it is super fun and the girls continue to ask to play. It will definitely join a short list of favorites on our game shelf. The cards are nice and thick and held up well to a fair bit of frantic playing in attempts to get the card played first. Shape Whiz is $24 and available here. Find SimplyFun on social media on Facebook, Twitter, Instagram, and Pinterest. To read more Crew reviews on this and one other game called Expanders from SimplyFun that’s geared for kids a few years younger that looked equally awesome, check out the Review Crew Blog.